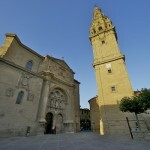 Santo Domingo de la Calzada was a major stop on the ancient Camino. The home of Saint Domingo and also a miracle that occurred in the town brought it to prominence and gave it an association with Chickens! 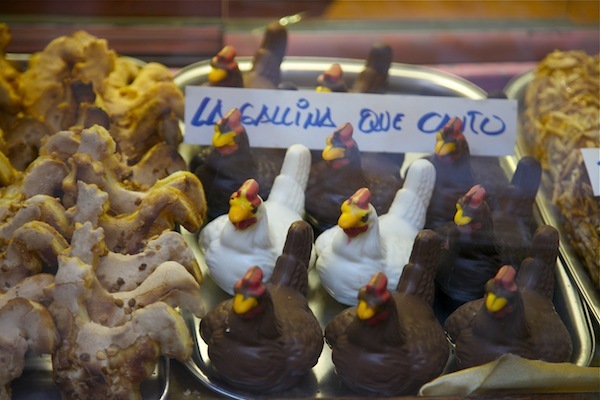 Live Chickens can still be seen inside the Cathedral here and chocolate ones in the souveneir shops. 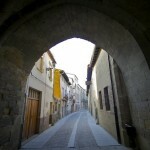 Saint Dominic helped build a wooden bridge over the Oja River to help pilgrims on the Way and established a hospital. He is the patron saint of engineers in Spain! 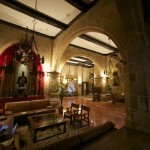 The story goes that in the 14th century, a young German goes on pilgrimage to Santiago de Compostela with his parents. A Spanish girl at the hostel where they were staying makes advances toward the boy who rejects her. Angry at this slight, the girl hides a silver cup in his bag and then informs the authorities that the youth had taken it. He is sentenced to the gallows and hung! The parents sadly decide to continue their pilgrimage but on the way back examine their son’s body, still hanging on the gallows and suddenly hear his voice –he tells them that Saint Dominic has saved his life. His parents quickly make their way to Santiago de Compostela to see the magistrate. The magistrate, who is at the time eating dinner, remarks: “Your son is as alive as this rooster and chicken that I was feasting on before you interrupted me.” And in that moment, the two birds jump from the plate and begin to sing and crow.